In October 2015, a Second Temple-period ritual bath (miqweh) was recorded at the ancient site of Nahal Nahshon (map ref. 200020/636595). The documentation, undertaken on behalf of the Israel Antiquities Authority, was conducted by U. Rotstein (surveying and drafting) and E. Klein (photography), inspectors from the Unit for the Prevention of Antiquities Robbery. 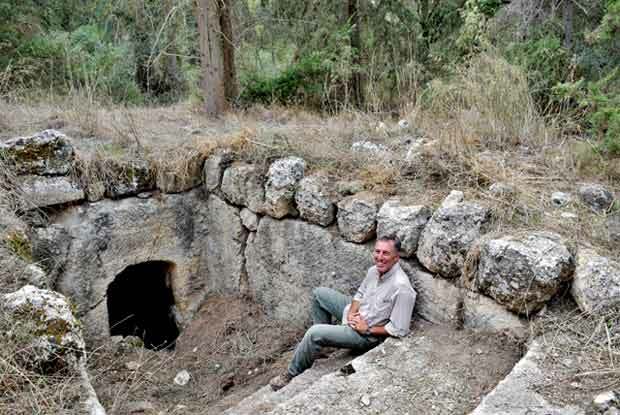 The site and the ritual bath were identified by U. Rotstein during routine inspections by the Unit for the Prevention of Antiquities Robbery. 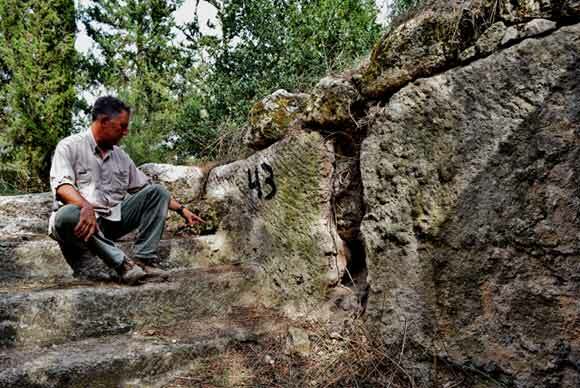 The site lies on a moderately sloping spur dropping down to Nahal Nahshon, c. 500 m northeast of ‘En Hela near the Burma Road and c. 2 km southeast of Latrun Monastery. 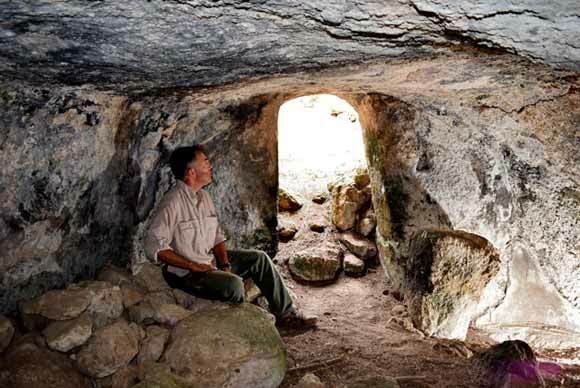 The Nahal Nahshon site extends across the lower part of the spur and contains the remains of buildings, walls, rock cuttings, a burial cave and agricultural installations. Potsherds dating from the Hellenistic–Early Roman periods were found throughout the site. A rock-hewn miqweh, probably used by local residents in the Early Roman period, was found in the upper part of the site. The site had not been previously investigated, but several excavations conducted at ‘En Hela to its south—the location of one of its main water sources—exposed architectural features associated with water storage (Ein Mor 2015). The rock-hewn miqweh (Fig. 1) has a hewn dromos (Cavity I; length 3.8 m, average width 2 m, estimated height 2.2 m near its end and the immersion chamber (Cavity II). The four upper steps of the dromos were exposed, but the remaining steps, leading to the immersion chamber, were covered with soil. The tread depth of the top step is c. 0.8 m and of the rest of the exposed steps is 0.3–0.4 m. Traces of gray hydraulic plaster found on the walls of the dromos and on the steps hewn in its floor contain small gravel inclusions, which are typical of the period extending from Herod’s reign to the Bar Kokhba Revolt (Porath 1989). Two dressed stones coated with gray plaster (Fig. 2) lay on the top step, in the northeast corner of the dromos. Walls, of which only a single course of dressed stones was preserved, were built on the hewn bedrock surface above the eastern, western and southern walls of the dromos (Fig. 3). These may have carried a barrel vault that roofed the dromos. 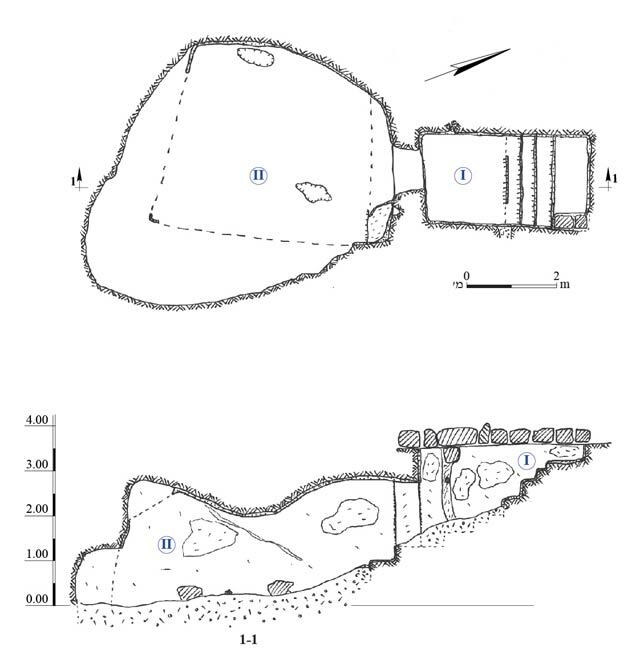 An opening (height 1.5 m, width 0.8 m, jamb width c. 0.5 m) cut in the south wall of the dromos leads to the immersion chamber. The floor of the immersion chamber (Cavity II) was covered with soil accumulations, making it impossible to reconstruct its exact form. In the eastern corner of the chamber, a wide step coated with gray hydraulic plaster—apparently the top step within the chamber—was discernible. Above this step, on the wall near the eastern jamb of the chamber’s entrance, was a triangular rock-hewn niche for an oil lamp (Fig. 4). In later periods, the chamber was apparently enlarged (length c. 7 m, width c. 6 m after enlargement) and put to some secondary use. Nevertheless, judging by the traces of the hydraulic plaster preserved on the walls and the ceiling of the cavity, it is possible to reconstruct the original dimensions of the immersion chamber (length c. 5.5 m, width c. 4 m). The architectural features of the ritual bath—its rock-hewn dromos coated with gray plaster, its easily accessible entrance which nevertheless required a bit of stooping, the stepped and plastered immersion chamber and the triangular oil-lamp niche—all suggest that the installation was used during the Early Roman period by local Jewish inhabitants who observed the laws of ritual purity (Reich 2013). Potsherds from the Hellenistic–Early Roman periods evident throughout the site reinforce corroborate this assumption. Ritual baths from this period have been found at other Jewish settlements nearby, as at Shemurat Shayyarot (Zissu, Solimany and Weiss 1997:101–102), Sheluhat Mishlatim (Zissu, Solimany and Weiss 1997:102), and Horbat ‘Aqed. Ein Mor D. 2015. ‘En Hela. HA-ESI 127. Porath Y. 1989. Plaster in Aqueducts as a Chronological Indicator. In D. Amit, Y.
Hirschfeld and J. Patrich eds. The Aqueducts of Ancient Palestine. Jerusalem. Pp. 69–76. Reich R. 2013. Miqwa’ot (Jewish Ritual Baths) in the Second Temple, Mishnaic and Talmudic Period. Jerusalem. Zissu B., Solimany G. and Weiss D. 1997. Shaʻar Hagay Survey. HA-ESI 107:100–102. 2. Steps in the dromos, looking northeast; note the plaster layer on the dressed stone capping the top step. 3. Staircase and miqveh entrance, looking northwest; note the stone-built wall above the sides of the dromos. 4. Cavity II and its entrance, looking northeast; note the triangular niche to the right of the entrance jamb and the plaster layer on the wall and upper step of the immersion chamber.